Aldosterone is a steroid hormone (mineralocorticoid family) produced by the outer section (zona glomerulosa) of the adrenal cortex in the adrenal gland. It plays a central role in the regulation of blood pressure mainly by acting on the distal tubules and collecting ducts of the nephron, increasing reabsorption of ions and water in the kidney, to cause the conservation of sodium, secretion of potassium, increase in water retention, and increase in blood pressure and blood volume. When dysregulated, aldosterone is pathogenic and contributes to the development and progression of cardiovascular and renal disease. Aldosterone has exactly the opposite function of the atrial natriuretic hormone secreted by the heart. Aldosterone is part of the renin–angiotensin system. Drugs that interfere with the secretion or action of aldosterone are in use as antihypertensives, like lisinopril, which lowers blood pressure by blocking the angiotensin-converting enzyme (ACE), leading to lower aldosterone secretion. The net effect of these drugs is to reduce sodium and water retention but increase retention of potassium. Another example is spironolactone, a potassium-sparing diuretic, which decreases blood pressure by releasing fluid from the body while retaining potassium. It was first isolated by Simpson and Tait in 1953. The corticosteroids are synthesized from cholesterol within the zona glomerulosa of adrenal cortex. Most steroidogenic reactions are catalysed by enzymes of the cytochrome P450 family. They are located within the mitochondria and require adrenodoxin as a cofactor (except 21-hydroxylase and 17α-hydroxylase). 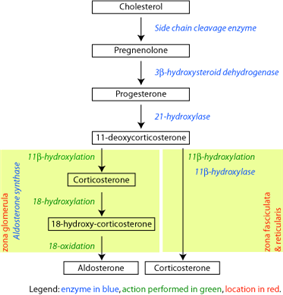 Aldosterone and corticosterone share the first part of their biosynthetic pathways. The last parts are mediated either by the aldosterone synthase (for aldosterone) or by the 11β-hydroxylase (for corticosterone). These enzymes are nearly identical (they share 11β-hydroxylation and 18-hydroxylation functions), but aldosterone synthase is also able to perform an 18-oxidation. Moreover, aldosterone synthase is found within the zona glomerulosa at the outer edge of the adrenal cortex; 11β-hydroxylase is found in the zona glomerulosa and zona fasciculata. increase in plasma angiotensin II, ACTH, or potassium levels, which are present in proportion to plasma sodium deficiencies. (The increased potassium level works to regulate aldosterone synthesis by depolarizing the cells in the zona glomerulosa, which opens the voltage-dependent calcium channels.) The level of angiotensin II is regulated by angiotensin I, which is in turn regulated by renin, a hormone secreted in the kidneys. Serum potassium concentrations are the most potent stimulator of aldosterone secretion. the ACTH stimulation test, which is sometimes used to stimulate the production of aldosterone along with cortisol to determine whether primary or secondary adrenal insufficiency is present. However, ACTH has only a minor role in regulating aldosterone production; with hypopituitarism there is no atrophy of the zona glomerulosa. the stretch receptors located in the atria of the heart. If decreased blood pressure is detected, the adrenal gland is stimulated by these stretch receptors to release aldosterone, which increases sodium reabsorption from the urine, sweat, and the gut. This causes increased osmolarity in the extracellular fluid, which will eventually return blood pressure toward normal. adrenoglomerulotropin, a lipid factor, obtained from pineal extracts. It selectively stimulates secretion of aldosterone. Acting on the nuclear mineralocorticoid receptors (MR) within the principal cells of the distal tubule and the collecting duct of the kidney nephron, it upregulates and activates the basolateral Na+/K+ pumps, which pumps three sodium ions out of the cell, into the interstitial fluid and two potassium ions into the cell from the interstitial fluid. This creates a concentration gradient which results in reabsorption of sodium (Na+) ions and water (which follows sodium) into the blood, and secreting potassium (K+) ions into the urine (lumen of collecting duct). Aldosterone upregulates epithelial sodium channels (ENaCs), increasing apical membrane permeability for Na+. Cl− is reabsorbed in conjunction with sodium cations to maintain the system's electrochemical balance. Aldosterone stimulates the secretion of K+ into the tubular lumen. Aldosterone stimulates Na+ and water reabsorption from the gut, salivary and sweat glands in exchange for K+. Aldosterone stimulates secretion of H+ in exchange for K+ in the intercalated cells of the cortical collecting tubules, regulating plasma bicarbonate (HCO3−) levels and its acid/base balance. Aldosterone is responsible for the reabsorption of about 2% of filtered sodium in the kidneys, which is nearly equal to the entire sodium content in human blood under normal glomerular filtration rates. Aldosterone, probably acting through mineralocorticoid receptors, may positively influence neurogenesis in the dentate gyrus. Steroid receptors are intracellular. The aldosterone mineralcorticoid receptor complex binds on the DNA to specific hormone response element, which leads to gene specific transcription. Some of the transcribed genes are crucial for transepithelial sodium transport, including the three subunits of the epithelial sodium channel (ENaC), the Na+/K+ pumps and their regulatory proteins serum and glucocorticoid-induced kinase, and channel-inducing factor, respectively. The mineralcorticoid receptor is stimulated by both aldosterone and cortisol, but a mechanism protects the body from excess aldosterone receptor stimulation by glucocorticoids (such as cortisol), which happen to be present at much higher concentrations than mineralcorticoids in the healthy individual. The mechanism consists of an enzyme called 11 β-hydroxysteroid dehydrogenase (11 β-HSD). This enzyme co-localizes with intracellular adrenal steroid receptors and converts cortisol into cortisone, a relatively inactive metabolite with little affinity for the MR. Liquorice, which contains glycyrrhetinic acid, can inhibit 11 β-HSD and lead to a mineralcorticoid excess syndrome. Angiotensin is involved in regulating aldosterone and is the core regulation. Angiotensin II acts synergistically with potassium, and the potassium feedback is virtually inoperative when no angiotensin II is present. A small portion of the regulation resulting from angiotensin II must take place indirectly from decreased blood flow through the liver due to constriction of capillaries. When the blood flow decreases so does the destruction of aldosterone by liver enzymes. The amount of aldosterone secreted is a direct function of the serum potassium as probably determined by sensors in the carotid artery. ACTH, a pituitary peptide, also has some stimulating effect on aldosterone, probably by stimulating the formation of deoxycorticosterone, a precursor of aldosterone. Aldosterone is increased by blood loss, pregnancy, and possibly by other circumstances such as physical exertion, endotoxin shock, and burns. The aldosterone production is also affected to one extent or another by nervous control, which integrates the inverse of carotid artery pressure, pain, posture, and probably emotion (anxiety, fear, and hostility) (including surgical stress). Anxiety increases aldosterone, which must have evolved because of the time delay involved in migration of aldosterone into the cell nucleus. Thus, there is an advantage to an animal's anticipating a future need from interaction with a predator, since too high a serum content of potassium has very adverse effects on nervous transmission. Pressure-sensitive baroreceptors are found in the vessel walls of nearly all large arteries in the thorax and neck, but are particularly plentiful in the sinuses of the carotid arteries and in the arch of the aorta. These specialized receptors are sensitive to changes in mean arterial pressure. An increase in sensed pressure results in an increased rate of firing by the baroreceptors and a negative feedback response, lowering systemic arterial pressure. Aldosterone release causes sodium and water retention, which causes increased blood volume, and a subsequent increase in blood pressure, which is sensed by the baroreceptors. To maintain normal homeostasis these receptors also detect low blood pressure or low blood volume, causing aldosterone to be released. This results in sodium retention in the kidney, leading to water retention and increased blood volume. Aldosterone is a function of the inverse of the sodium intake as sensed via osmotic pressure. The slope of the response of aldosterone to serum potassium is almost independent of sodium intake. Aldosterone is much increased at low sodium intakes, but the rate of increase of plasma aldosterone as potassium rises in the serum is not much lower at high sodium intakes than it is at low. Thus, the potassium is strongly regulated at all sodium intakes by aldosterone when the supply of potassium is adequate, which it usually is in primitive diets. Feedback by aldosterone concentration itself is of a nonmorphological character (that is, other than changes in the cells' number or structure) and is poor, so the electrolyte feedbacks predominate, short term. Hyperaldosteronism is abnormally increased levels of aldosterone, while hypoaldosteronism is abnormally decreased levels of aldosterone. A measurement of aldosterone in blood may be termed a plasma aldosterone concentration (PAC), which may be compared to plasma renin activity (PRA) as an aldosterone-to-renin ratio. Primary aldosteronism, also known as primary hyperaldosteronism, is characterized by the overproduction of aldosterone by the adrenal glands, when not a result of excessive renin secretion. It leads to arterial hypertension (high blood pressure) associated with hypokalemia, usually a diagnostic clue. Secondary hyperaldosteronism, on the other hand, is due to overactivity of the renin-angiotensin system. Conn's syndrome is primary hyperaldosteronism caused by an aldosterone-producing adenoma. Depending on cause and other factors, hyperaldosteronism can be treated by surgery and/or medically, such as by aldosterone antagonists. An ACTH stimulation test for aldosterone can help in determining the cause of hypoaldosteronism, with a low aldosterone response indicating a primary hypoaldosteronism of the adrenals, while a large response indicating a secondary hypoaldosteronism. ^ a b c d Hu C, Rusin CG, Tan Z, Guagliardo NA, Barrett PQ (June 2012). "Zona glomerulosa cells of the mouse adrenal cortex are intrinsic electricaloscillators.". J Clin Invest. 122 (6): 2046–2053. ^ Williams JS, Williams GH (June 2003). "50th anniversary of aldosterone". J Clin Endocrinol Metab. 88 (6): 2364–72. ^ Farrell G (May 1960). "Adrenoglomerulotropin". Circulation 21 (5): 1009–15. ^ Hurwitz S, Cohen RJ, Williams GH (April 2004). "Diurnal variation of aldosterone and plasma renin activity: timing relation to melatonin and cortisol and consistency after prolonged bed rest". J App Physiol 96 (4): 1406–14. ^ Palmer, LG; Frindt, G (2000). "Aldosterone and potassium secretion by the cortical collecting duct". Kidney international 57 (4): 1324–8. ^ Rector, Floyd C.; Brenner, Barry M. (2004). Brenner & Rector's the kidney. Philadelphia: Saunders. ^ Sherwood, Lauralee (2001). Human physiology: from cells to systems. Pacific Grove, CA: Brooks/Cole. ^ Fischer AK, von Rosenstiel P, Fuchs E, Goula D, Almeida OF, Czéh B (August 2002). "The prototypic mineralocorticoid receptor agonist aldosterone influences neurogenesis in the dentate gyrus of the adrenalectomized rat". Brain Res. 947 (2): 290–3. ^ Page 866-867 (Integration of Salt and Water Balance) and 1059 (The Adrenal Gland) in: Walter F., PhD. Boron (2003). Medical Physiology: A Cellular And Molecular Approaoch. Elsevier/Saunders. p. 1300. ^ Williams GH, Dluhy RG (November 1972). "Aldosterone biosynthesis. Interrelationship of regulatory factors". Am J Med 53 (5): 595–605. ^ Pratt JH (September 1982). "Role of angiotensin II in potassium-mediated stimulation of aldosterone secretion in the dog". J Clin Invest. 70 (3): 667–72. ^ Messerli FH, Nowaczynski W, Honda M; et al. (February 1977). "Effects of angiotensin II on steroid metabolism and hepatic blood flow in man". Circulation Research 40 (2): 204–7. ^ Felizola SJA, Maekawa T, Nakamura Y, Satoh F, Ono Y, Kikuchi K, Aritomi S, Ikeda K, Yoshimura M, Tojo K, Sasano H. (2014). "Voltage-gated calcium channels in the human adrenal and primary aldosteronism.". J Steroid Biochem Mol Biol. 144 (part B): 410–416. ^ Bauer JH, Gauntner WC (March 1979). "Effect of potassium chloride on plasma renin activity and plasma aldosterone during sodium restriction in normal man". Kidney Int. 15 (3): 286–93. ^ Linas SL, Peterson LN, Anderson RJ, Aisenbrey GA, Simon FR, Berl T (June 1979). "Mechanism of renal potassium conservation in the rat". Kidney Int. 15 (6): 601–11. ^ a b Gann DS Mills IH Bartter 1960 On the hemodynamic parameter mediating increase in aldosterone secretion in the dog. Fed. Proceedings 19; 605–610. ^ Gann DS, Cruz JF, Casper AG, Bartter FC (May 1962). "Mechanism by which potassium increases aldosterone secretion in the dog". Am J Physiol. 202: 991–6. ^ Brown RD, Strott CA, Liddle GW (June 1972). "Site of stimulation of aldosterone biosynthesis by angiotensin and potassium". J Clin Invest. 51 (6): 1413–8. ^ Ruch TC Fulton JF 1960 Medical Physiology and Biophysics. W.B. Saunders and Co., Phijl & London. On p1099. ^ a b Farrell G (October 1958). "Regulation of aldosterone secretion". Physiological Reviews 38 (4): 709–28. ^ a b Vecsei, Pál; Gláz, Edith (1971). Aldosterone. New York: Pergamon Press. ^ a b Venning EH, DyrenfurthY I, Beck JC (August 1957). "Effect of anxiety upon aldosterone excretion in man". J Clin Endocrinol Metab. 17 (8): 1005–8. ^ Elman R, Shatz BA, Keating RE, Weichselbaum TE (July 1952). "Intracellular and Extracellular Potassium Deficits in Surgical Patients". Annals of surgery 136 (1): 111–31. ^ Sharp GUG Leaf A 1966 in; Recent Progress in Hormone Research. (Pincus G, ed. ^ Copstead, E. C. & Banasik, J. L. (2010.) Pathophysiology. (4th ed.). St. Louis, Mo: Saunders Elsevier. ^ Marieb, E. N. (2004) Human anatomy and physiology (6th ed) San Francisco: Pearson Benjamin Cummings. ^ Schneider EG, Radke KJ, Ulderich DA, Taylor RE (April 1985). "Effect of osmolality on aldosterone secretion". Endocrinology 116 (4): 1621–6. ^ Dluhy RG, Axelrod L, Underwood RH, Williams GH (August 1972). "Studies of the control of plasma aldosterone concentration in normal man: II. Effect of dietary potassium and acute potassium infusion". J Clin Invest. 51 (8): 1950–7. ^ Conn JW, Louis LH (1955). "Primary aldosteronism: a new clinical entity". Trans. Assoc. Am. Physicians 68: 215–31; discussion, 231–3.